Queen's Community Music, QCM (formerly Queen's Conservatory of Music) is a vibrant center for anyone who has a passion for music. Housed in Queen's School of Music, QCM offers a wide range of educational opportunities in a non-credit setting. From private lessons to group courses, ensembles, workshops and performance opportunities, QCM provides high quality instruction for musicians of all ages, and fosters interaction and engagement between Queen’s students, faculty, staff and the greater Kingston community through shared learning experiences in a positive environment. 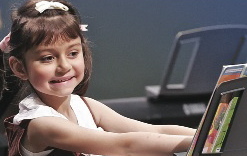 QCM promotes mutual respect, confidence, commitment, and teamwork through all music learning activities. Give yourself or someone else the gift of music today!